Intel Corporation (INTC) designs, manufactures, and sells integrated circuits for computing and communications industries worldwide. It offers microprocessor products used in desktops, workstations, servers, embedded products, communications products, notebooks, netbooks, mobile Internet devices, and consumer electronics. It has been attempting to diversify by making chipsets for embedded designs for industrial equipments, point-of-sale systems, panel PCs, automotive information/entertainment systems, and medical equipment. INTC is not a dividend achiever. It has been paying growing dividends for last 5 calendar years. The latest dividend increase was in February 2010. I had last reviewed INTC in July 2009. My objective here is to analyze INTC is a continuing to be a good dividend growth stock and how it will rate on my scale of risk-to-dividends. Revenue: Overall the revenue growth as been flat for last 5 years. 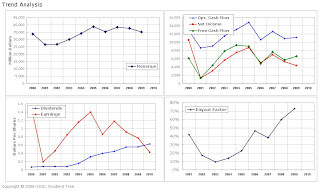 Cash Flows: In general, a range bound operating cash flow, which does not show increasing trend. 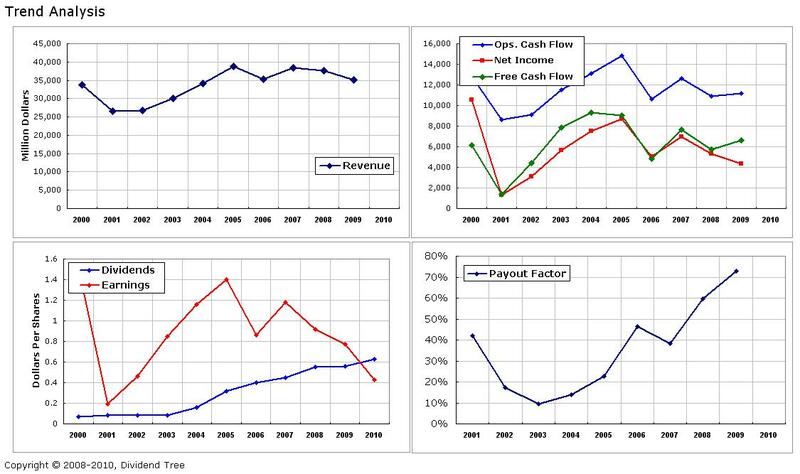 The free cash flow is generally close to net income. EPS from continuing operation: In general, a range bound EPS from continuing operations. Overall, not an increasing trend. Dividends per share: Consistently growing dividends since 2003. Here I use the corporation’s financial health to assign a risk number for measuring risk-to-dividends. The risk number for risk-to-dividends is 2.29. This is a medium risk category (very close to being high risk) as per my 3-point risk scale. The increased payout factor and erratic EPS makes it a medium risk-to-dividends. Dividend growth rate: The average dividend growth of 14.8% (stdev. 9.2%) is more than average EPS growth rate of (3.8)% (stdev. 31%). Dividends have grown faster than earnings per share. Duration of dividend growth: 5 years. 4 year rolling dividend growth rate for past ten years: Less than 10% for past 8 years. More than 10% for last five years. Payout factor: In the past 8 years, it has been in the range of 10% to 60%. Very wide range. It is now at 72% (at the end of 2009). Dividend cash flow vs. income from MMA: Here, I analyze how the dividend cash flow stacks up against the income from FDIC insured money market account. The baseline assumption is (a) stock is yielding 2.8%; and (b) MMA yield is 1.75%. Last 5 years average dividend growth rate has been 14.8%. I do not expect INTC dividend growth rate at 14.8%. With my projected dividend growth of 3.5%, the dividend cash flow is twice the MMA income at the price of $20.10. The range of fair value is calculated as $12.6 to $16.2. INTC continues to remain un-challenged leader in the computing microprocessor market segment. Its sole challenger, AMD keeps raring its head every once in a while. However, it has not seen any sustained challenge. On occasions this makes the company complacent and ignoring what the markets wants. • Like with any other technology company it is operates in a cyclical industry. Current recession seems to have had a significant impact. The recent 2010 Q1 results make us believe earnings are returning back. • The company seems to have entered into stagnation phase where it already has majority of market share. It banks of expansion of market for growth. • INTC is continuously searching for new growth areas with not much success so far. • Lately, it has had few initiatives to go into newer market segments viz. the health care diagnostics products, MIDI devices using its low cost ATOM family of products, and embedded chips. Time will tell whether these two areas provide any growth to the company. The growth in dividends in last five years seems to be the result of historically low payout factor. This dividend growth does not seem to be as a result of the growth in EPS. I like INTC technological driven supremacy in its product segment. It has been raising dividends for last five years only. This growth seems be due to historically low payout factor instead of growth in EPS. The stock’s current risk-to-dividend rating is 2.3 (medium risk). This is very close to my high risk point of 3.0. I will continue to hold my existing INTC stock in my dividend portfolio. However, I will only add if the price goes to lower end of my fair value range. Full Disclosure: Long on INTC.